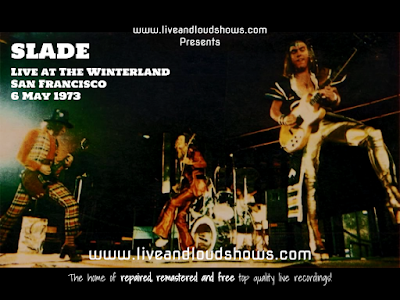 A great set from Slade from one of their many dates in the USA; a short set from when they were second on the bill to Humble Pie. The source is a bootleg with other tracks tacked on from a different gig - but I like the sets on here to represent individual gigs wherever possible, so this is just the 6 tracks from The Winterland. It's a great recording anyway with just a couple of things that needed repairing before I could set the 30 band EQ loose on it. The EQ cleared the mix quite a bit and brought out the drums - this is a really powerful performance (well, Hear Me Calling isn't quite so much but once the sound guy had sorted out the mix they were off and rocking!) 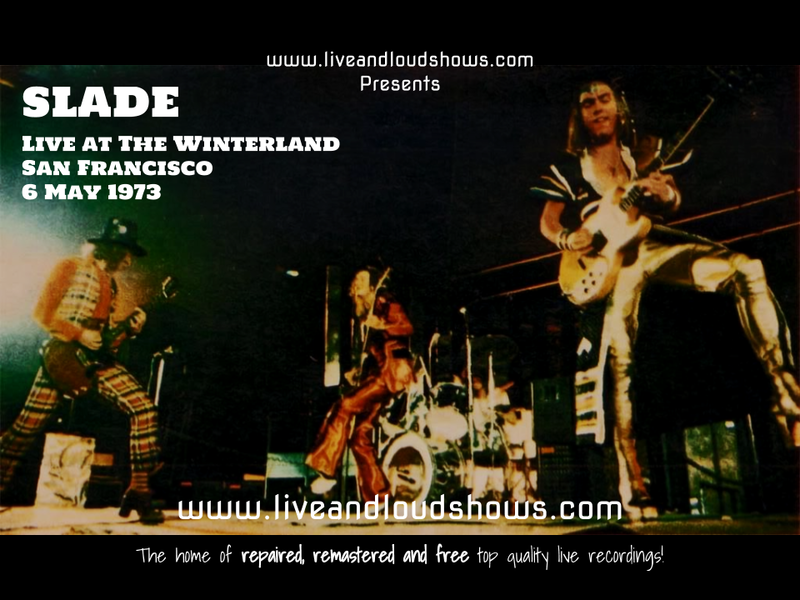 and, like Slade live always was, best played loud! You can download this improved recording for free here as one 320 kbps MP3 file. Or, if you would like to support the site with a small donation towards storage subscription and internet costs, in return you can have the show as separate, properly tagged MP3s or even lossless files in FLAC format; head on over to the Donations tab to see how you can do this. Either way - enjoy the show! Incidentally - this site has some great pictures taken from a gig the night before at the same venue, along with a write up of the experience. Well worth a read while you're listening to the gig!